Hi. Thanks for this interesting tool. I found in FC0.16 and FC 0.17 that your macro runs at once in the Part Workbench. But in Arch Workbench, when you just opened the program, it fails. I ran the macro a second time and only then it worked. I knew meshing that frame was going to be tricky. Changing the Gmsh parameters for maximum size =40mm it runs fine! But I am not sure the mesh get created correctly, it still seams to me that some parts are not connected, but I am not sure, I ran the FEM analysis wihtout enough knowledge, it was the first in FreeCAD that I ever created. can you give it a try? But in Arch Workbench, when you just opened the program, it fails. Thanks for pointing this out, it has been fixed now. Should we use gitlab for pointing bugs/issues so we dont clogg this forum? Ok I ran the FEM analysis successfully. The resulting object was a compound with many solids in it, creating mesh problems for gmsh, I exploded the compound and fused all the solids into one, then refined the geometry and the FEM analysis goes smoothly! I will work on the FEM switch so it ends up with ONE solid, I hope it does not become so difficult. What about headers and jack studs; I would expect this result based on their absence! The "Top Plate" fails as the result of lack of "Opening-Header"; No? Any plans for this additional support? Bill, you are missing the point. we are not discussing the capability of this particular frame to bear load, we are trying to make software, that creates "any" frame which can then be tested by the FEM workbench under load. And yes, we have the headers in our plans. (both box and I beam) I don't know what do you call jack studs I assume some sort of uplift retainers for shear,but please let me know. can you post your file from your FEM-example above? That reduces the file size. I think you could work with two categories. Simple Frame (non-structural wall) and Structural Frame (load-bearing wall). The Structural Frame could start considering Header Beams for the openings and some double studs. Thanks bitacovir That is exactly what's on my plans, another boolean switch for structural, If turned on it will place those headers on, it will let you choose if yo want the studs of the header in a box configuration or an I beam. but for now, I am working on the FEM side. So many things to do. 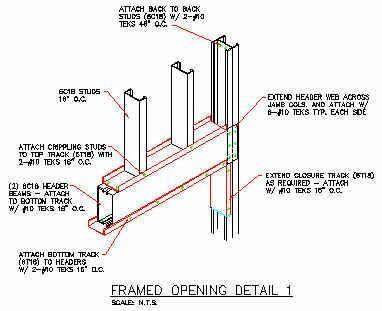 But I believe that being steel studs the way most developed nations build, having a good steel stud frame support from FreeCAD could help a lot of more people adopt it for Architectural work. We will get there, just be patient. That is not a bad strategy. Yorik developed a group of tools focus on the WikiHouse workflow. You can do the same. There are a lot of guides for galvanised steel frame technology. You can use those as a base to develop a set of few tools for that purpose. In my experience designing this kind of structures is a process that consumes a lot of time. Just the drawings with the elevations of each wall structure is a very boring task.